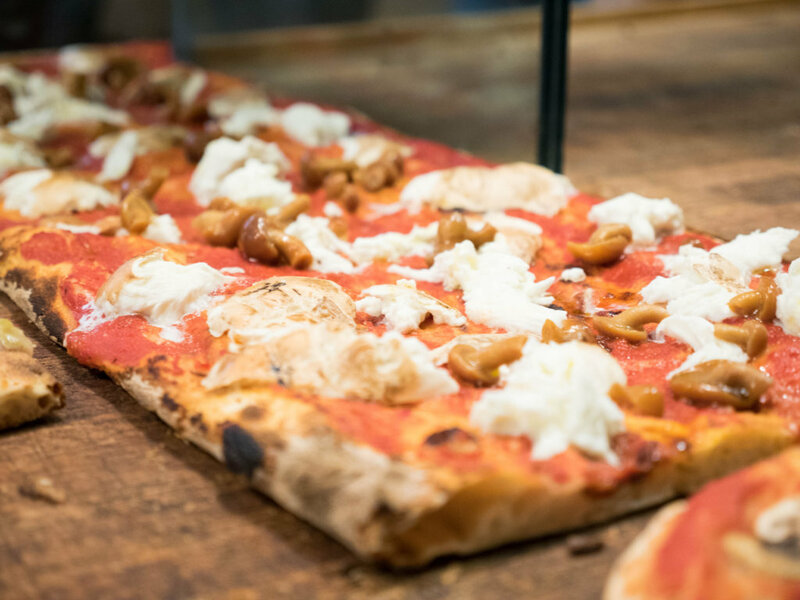 Enjoy the contemporary roman atmosphere of this little pizza shop while tasting the crunchiest, most delicious "pizza alla pala" in Bologna. Here’s a stop-over that should never miss on any serious Bologna food tour: pizza at Pizzartist. What? Pizza? Isn’t that from Naples and isn’t Bologna all about fresh pasta and cured meat? Well yes and no. Bologna recently became a champion on “pizza al taglio” (a different kind of pizza, typical of Rome, sold by the slice) and this is mostly thanks to Pizzartist. This little shop opened some 6 years ago and took Bologna by storm, generating a virtuous circle and witnessing the opening of other similar shops around town, none of which can rival. 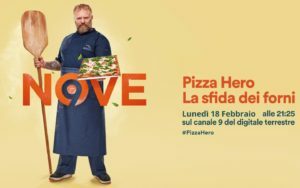 As a matter of fact, Pizzartist just won the local episode of reality/food show Pizza Hero, thanks to a “pizza baciata” (literally “kissed pizza”), where two slices are facing one another while their respective fillings merge …. Yummy. Back to history. 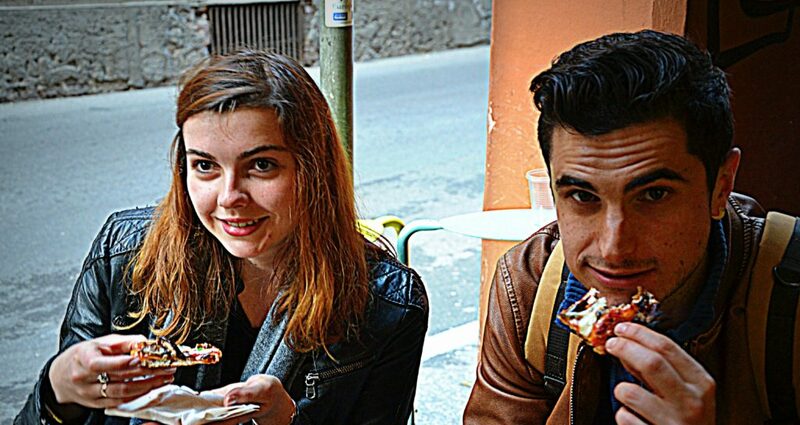 Pizzartist is a real labour of love, the brainchild of young lovebirds Marco and Erica, respectively from Rome and Modena. They used to meet in Bologna and eventually moved there together, but while being sentimentally fulfilled Marco was missing Rome’s iconic “pizza alla pala” too much… so, since he had some previous professional experience in pizza making, he decided to open his own shop on Via Marsala, almost in the heart of the Uni area. 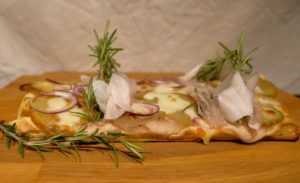 What is pizza alla pala? 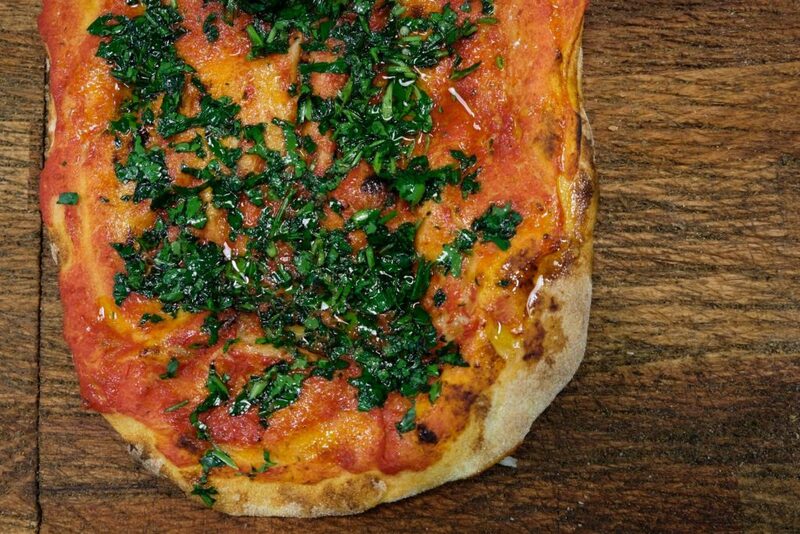 It’s a kind of pizza al taglio where the dough, initially divided into little balls, is spread over a wooden cooking shovel and later cooked directly on the stone of the electric oven (so no tray in the oven). This and the durum wheat of the dough makes for a particularly “scrocchiarella” (roman for “crunchy”) pizza. 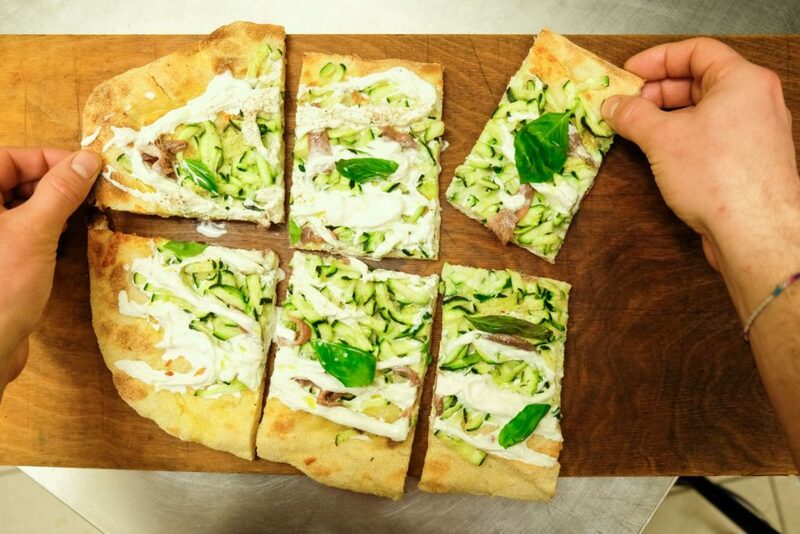 It must have been this scrocchiarella quality, along with the uniqueness of Pizzartist’s pizza flavour, that recently made Marco, Erica and partners win Pizza Hero and be awarded (with the restyling of the shop) by “ the Michelangelo of pizza” Gabriele Bonci. Actually there’s no need to turn on the tv to know how popular Pizzartist is: it is sufficient to go during opening times and see how packed it is. As a matter of fact, to have a brief interview with Patrizio (one of the regulars of Pizzartist, who appeared on Pizza Hero along with Marco, and who like the rest of the staff is also from Rome), I had to schedule an appointment. Patrizio confirmed to me that the crowd you see at Pizzartist is a happy mix: from university students to local workers to families, all enjoying a little slice of crunchy happiness. 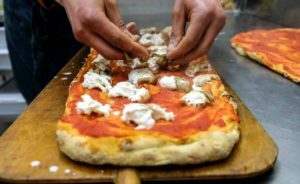 The most popular pizzas are margherita, pumpkin cream and salsiccia, all those with buffalo mozzarella (with the “bufala” coming straight from Campania’s Cilento) and the marinara. And with a bite of the latter, my personal favorite, ended my first trip “on assignment” to my regular, beloved pizza shop Pizzartist. Now it’s your turn to pick you favorite flavor. 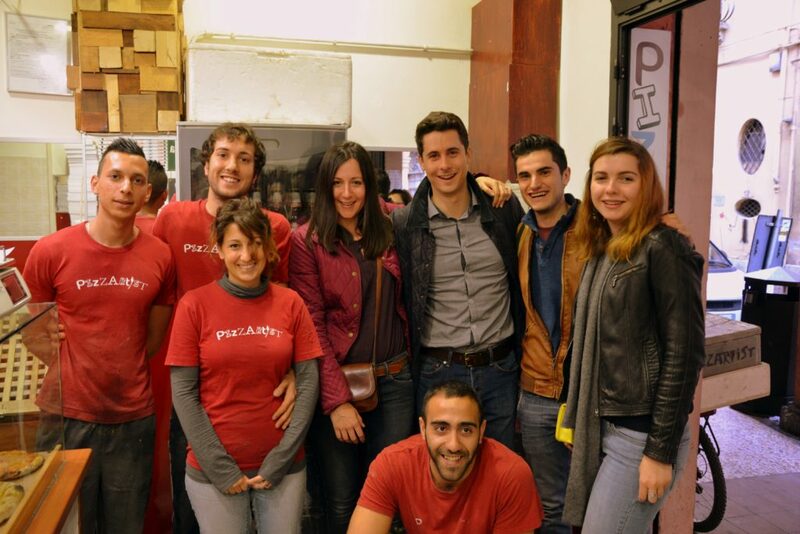 Pizzartist is on Via Marsala 35/a and (only in the evenings) on Via Stalingrado 12. And it’s also a stop of our food tour! Don’t miss it, book it now!